The United States is rapidly shifting toward a more aggressive foreign policy with limited public debate. 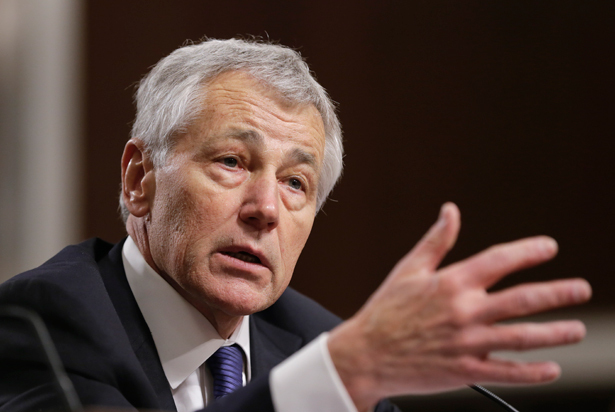 Defense Secretary Chuck Hagel’s surprise resignation—reportedly at the strong urging of the White House—will dominate Beltway news in the coming days. But perhaps the much more significant foreign-policy news came early Saturday morning. The New York Times reported that the United States will expand its mission in Afghanistan in 2015, with US troops participating in direct combat with the Taliban while American airpower backs Afghan forces from above. The shift, leaked anonymously to reporters ahead of a holiday week, is a big “oh, nevermind” to Obama’s very public announcement six months ago in the Rose Garden that US troops in Afghanistan would be shifting into a training and advisory role next year. The president didn’t even make a glancing reference to the Afghanistan reversal in his remarks announcing Hagel’s departure. The administration would clearly prefer a limited public debate, and based on the media coverage so far, it is getting its wish. Mr. Obama’s decision, made during a White House meeting in recent weeks with his senior national security advisers, came over the objection of some of his top civilian aides, who argued that American lives should not be put at risk next year in any operations against the Taliban—and that they should have only a narrow counterterrorism mission against Al Qaeda. But the military pushed back, and generals both at the Pentagon and in Afghanistan urged Mr. Obama to define the mission more broadly to allow American troops to attack the Taliban, the Haqqani network and other militants if intelligence revealed that the extremists were threatening American forces in the country. Was the historically dovish Hagel one of these officials? It is certainly curious that his departure directly coincides with the new aggressive plan for Afghanistan. No reporting yet indicates that for certain, and Hagel is notoriously guarded—one reason cited for his resignation was reportedly that he remained quiet in meetings, supposedly to avoid leaks of his position. It is certainly possible that ISIS’s rapid emergence and other foreign-policy crises contributed to Hagel’s poor standing inside the White House, along with his reported leadership problems. Ultimately, that’s an academic question for the administration’s biographers. What matters now is that the United States is changing course toward a more aggressive foreign policy: it is recommitting to the war in Afghanistan, which is by far the country’s longest and now promises to span two two-term presidencies. The number of troops in Iraq has doubled, and the administration will soon seek an authorization from a Congress that is extremely unlikely to include a provision that outlaws direct combat by US troops. Even supposed doves like Rand Paul are switching their position on fighting ISIS, and the incoming class of senators has distinct interventionist positions. Hagel’s departure—and the confirmation of his successor—will hopefully allow for some serious public debate about this new turn, even if the administration prefers otherwise. The real story here is about the policy, not the personnel.